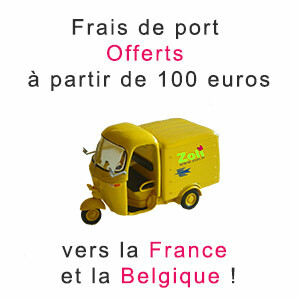 Shipment is free for every order over 100 euros for France, Belgium or Switzerland. For any other destination, please fill the customer form with your delivery address. Shipping taxes will be set and VAT deducted. If the delivery address is wrong or uncomplete and the parcel is sent back to us, you will be charge with 10 euros to ship it again at the correct address. You can also forward us your personnal carrer voucher we agree to use. Shippping rates are set in the cart, once you select the delivery address. Interational shipping fees are not refunded. Our orders are sent everyday, except wednesday and sunday. It is usually sent withing 48 hours after the order is placed. Your order will be sent with the international service from the French carrier. It will be forwarded to your national postal carrier. This is the express French carrier. Please, ask if you need that service. You can find some of our products at our international partners shops. The French VAT (20%) will not be charged to your order. When ou receive the parcel, the postman will charge you with customs fees and domestic VAT.